Is this a pic of the future after GAB? I'd mark if you had a shirt on with that. WATCH OUT!!! There is a DiG behind you!!!!! 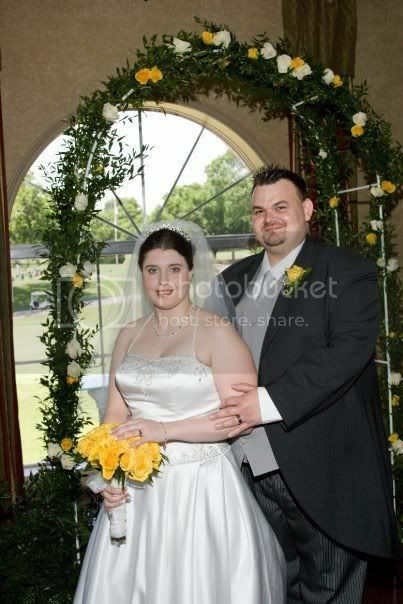 It's the first time I've seen one of the wedding pics, and I must say that both of you looked great. I have no idea why, but this picture turned out really dark even though the room was well lit. I thought it looked pretty cool anyway, so I messed around with the contrast and brightness settings for a moment. I give that impression an 8 out of 10. Come on guys, she's only 10. I give her the same score as her age, then. And because of that quote, T.K. is capable of smiling. See? Damn, TKJ. Are you Pentecostal? Because I'd love to speak in tongues with you. ... I may or may not 110% mean this. That is a nice tuxedo, you look great in it! Wait....You're on the left. Never mind! Two of my pics no-sold already! Do I have nucelar heatz? I can't really see Ichi-Man's photo that well, but my guy looks pretty good. Move somewhere warmer and become a swimsuit model.